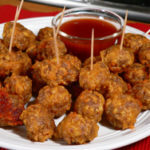 Follow our complete, step-by-step, photo illustrated recipe to make these super easy Sausage Ball Appetizers. You only need three ingredients, sausage, cheese and Bisquick. A real crowd pleaser for your next party or family get together. Printable recipe included. If you’re looking for a quick and easy appetizer recipe for your next party, game day, or any type of family get together, I think you’ve found it. With just three ingredients, it probably doesn’t get much simpler to make. This recipe is pulled from a collection of recipes compiled by members of my family and published back in 1999. The “Stewart Family Favorites” is a small cookbook, shared with the family, at what use to be our annual family reunions. These were relatives from my mothers side of the family, but sadly we no longer have the reunions any more. My cousin Aleane submitted this recipe for the cookbook as one of her favorites. Aleane was the daughter of my Aunt Lucille, one of my moms sisters. She was older than me, and in the age group of my older brother and sister. I think I look at my cousins as the ones I played with (my age group), and the ones that were older than we were. Thank you Aleane, for sharing this as a family favorite. We miss you. You can make these with Mild Sausage, or you could use your favorite Hot Sausage. The choice is yours, or maybe make a batch of each. Ready to make some Sausage Balls? Then let’s get in the kitchen, and… Let’s Get Cooking. 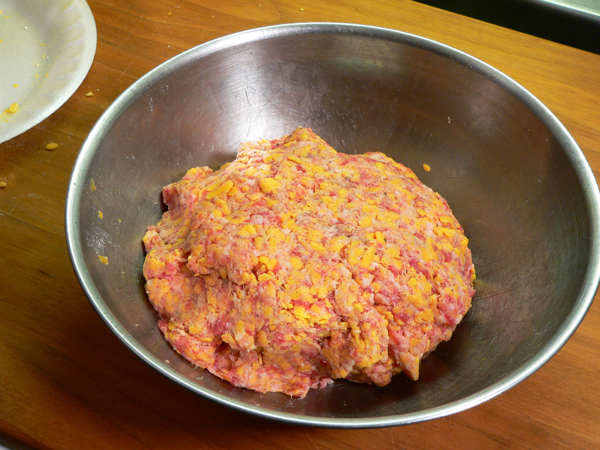 Sausage Balls Recipe: You’ll need these three ingredients. Grate your block of cheese. Please avoid buying pre-shredded cheese for this recipe. You’ve probably noticed that white powder stuff on the pre-shredded cheeses. 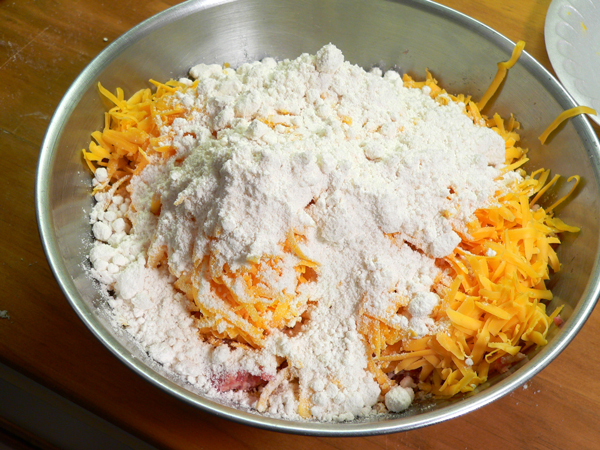 It’s some kind of potato starch that keeps the grated or shredded cheese from sticking together. I think you’ll find that buying a block of cheese and grating it yourself will give much better results and a much better taste. 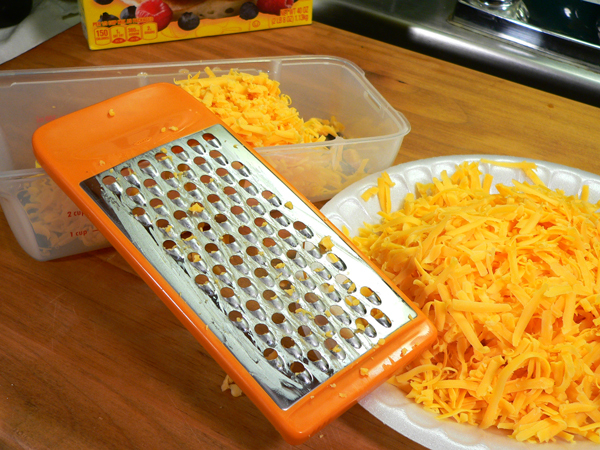 Keep your cheese cold until you’re ready to grate it, and it will be much easier to handle. Grating the cheese yourself will only take an extra minute or two, but will be well worth the effort. 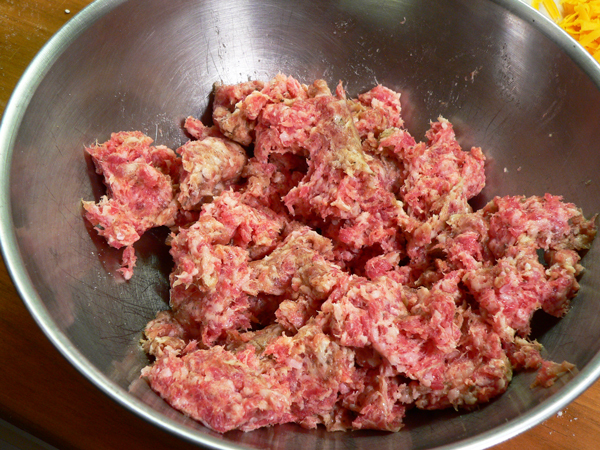 Place your sausage in a large mixing bowl. 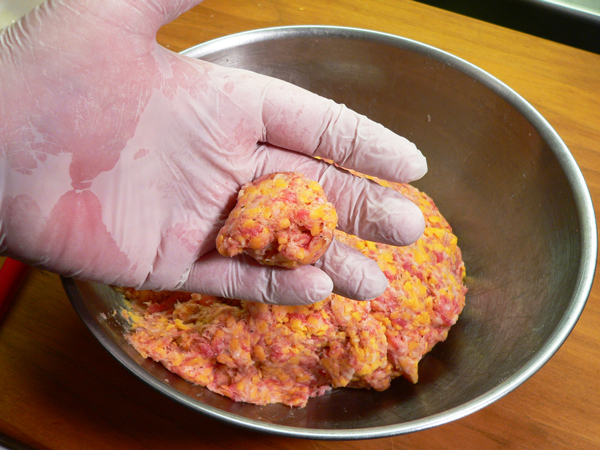 Use your hands to crumble up the sausage. 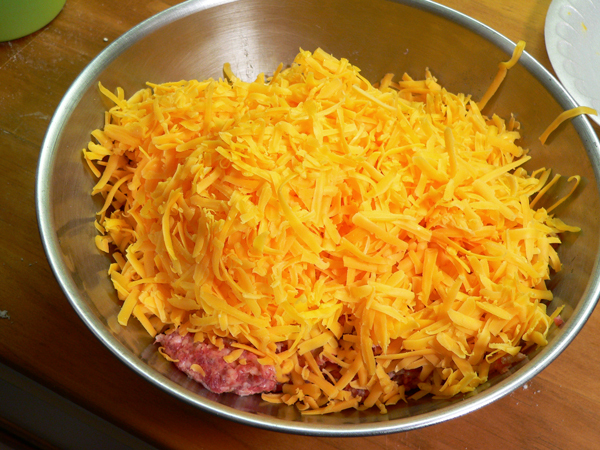 Add the grated cheese to the crumbled up sausage. Take your time with this step. Just slowly work all the ingredients around in the bowl, scooping up from the bottom as you go. After a minute or two of mixing, everything will seem to suddenly come together as pictured above. You can use a spoon, but I have a small scoop so I used that. I think this one measures out about a Tablespoon or so. Place it in your hand. No, I don’t always wear gloves while cooking at home. Just sometimes. Roll the mixture around in your hands. 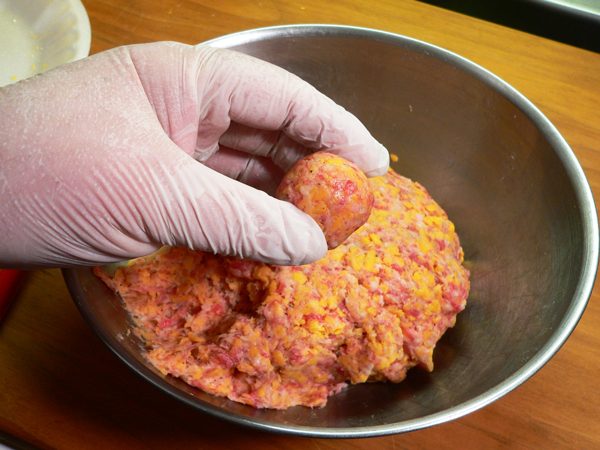 Shape the mixture into balls. You’ll want to pack it together firmly. 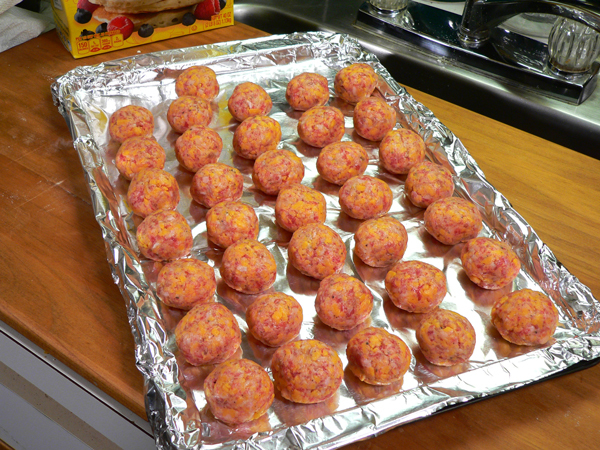 Place the sausage balls on a foil lined baking sheet, leaving a small amount of space between each one. You will also want to lightly spray the foil with cooking spray or rub it lightly with oil before you add the rolled sausage balls. I ended up with a total of 36 sausage balls. Place the sausage balls in your oven, pre-heated to 325F degrees. Let them bake for about 15 to 20 minutes, or until done. After about 10 minutes, rotate the pan in your oven so they can bake more evenly. You might have to sacrifice one by breaking it open to be sure it’s done. Baking them too long could cause them to dry out and be hard, so try not to overcook them. Remove the pan when the sausage balls are done. I tried two ways to see which would be the best way to get them out of the pan. Using two spoons, one to hold down the foil and one to move the sausage ball, I managed to get them off the foil without a lot of sticking or breaking. I think it will be best to let them cool before trying to remove them though. The few I left on the foil until they cooled were much easier to remove. Just do what seems to work best for you. I did place them on some paper towels to let them drain a bit once I removed them. I was very pleased with how easy these were to make, and how well they turned out. I watched them closely during the last few minutes of baking and thankfully, they were moist and not all hard and dried out. 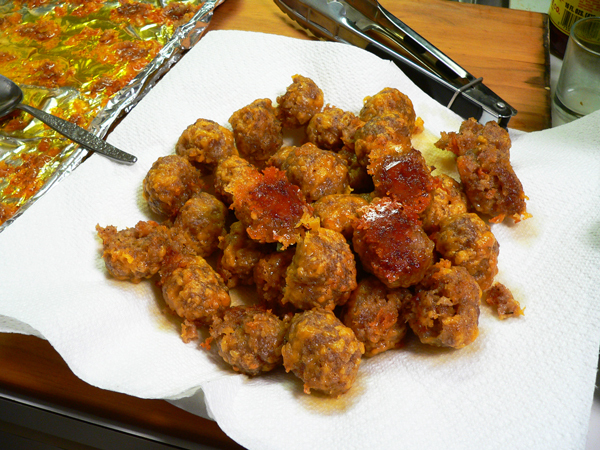 Sausage Balls are generally served at room temperature. Keep them covered and refrigerated until you’re ready to set them out on your party table. Frilly toothpicks will make them easy to pick up and use as finger food. As you can see, I didn’t have those, so use whatever you might have on hand. This is one of those recipes that can be made a day or two ahead of time. You could cook them, and then cover and refrigerate them for several days before you needed them. Or, shape them and bake them shortly before you plan to serve them. I’ve had some in the refrigerator for a week now and they are still moist and tasty after just a few seconds in the microwave. I didn’t try to freeze any, but I understand they do freeze well also. Yield: Approximately 36 sausage balls. Follow our complete, step-by-step, photo illustrated recipe to make this super easy Sausage Ball Appetizers. 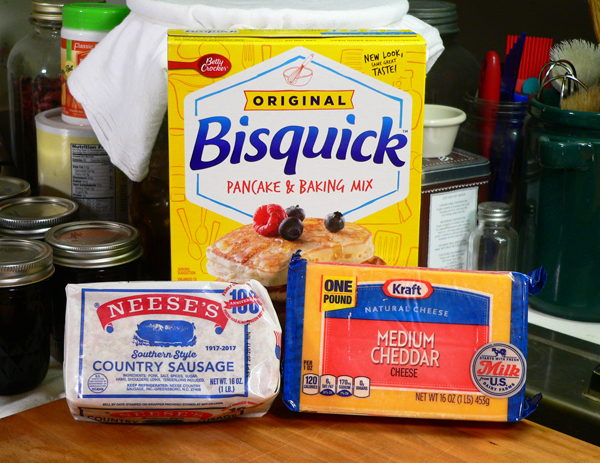 You only need three ingredients, sausage, cheese and Bisquick. A real crowd pleaser for your next party or family get together. 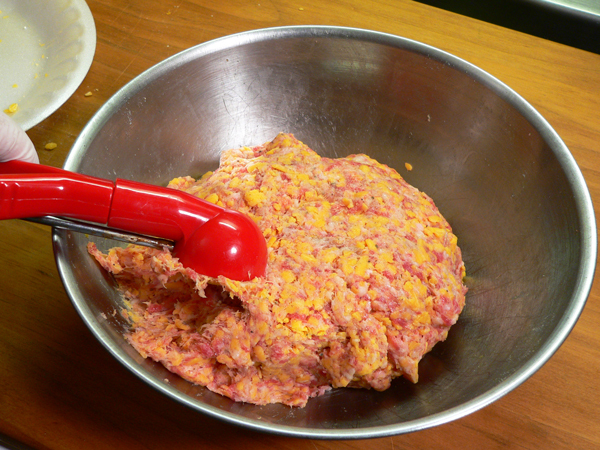 Add sausage to a large mixing bowl. Break up sausage into small pieces. Mix all ingredients together well. Roll into small bite size balls, about 1 inch in size. Line a baking sheet with foil. Rub or spray with cooking oil. 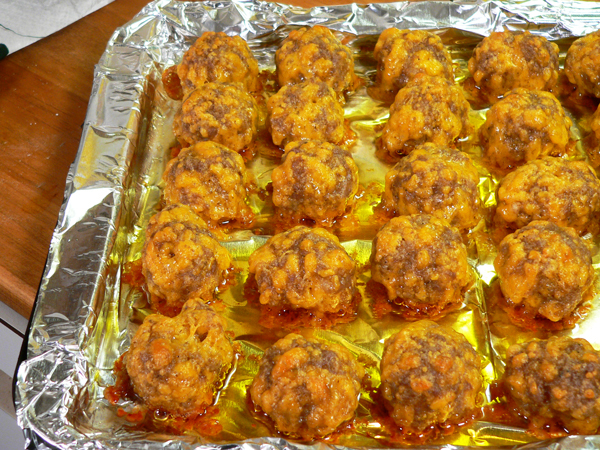 Place sausage balls on baking sheet, leaving space between each one. Bake in 325F degree oven for 15-20 minutes until done. For best results, rotate pan after about 10 minutes so they cook more evenly. Remove from oven when done. Let Cool. Carefully loosen from pan with a spoon or fork. Drain on paper towels if desired. Make these ahead of time. Either shape, cover and refrigerate to bake just before serving. Or, bake them, cover and refrigerate, then remove an hour or so before serving. 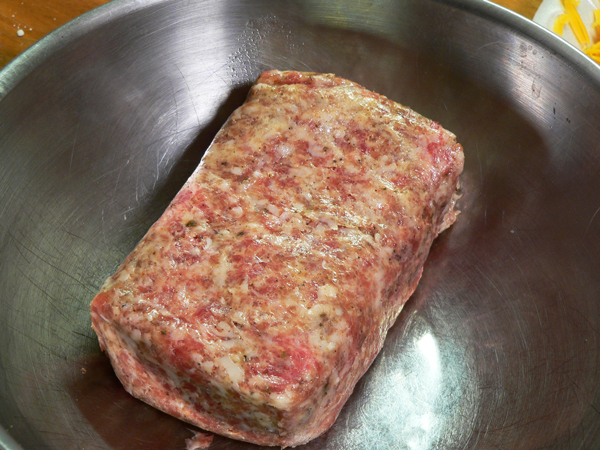 Sausage Balls are usually served at room temperature. Can easily be frozen also. Your Comments: What’s your go to appetizer? Ever made Sausage Balls? Do you like them? I’d love to hear your thoughts on our recipe. It will only take a minute or two for you to leave your comments in the section below. Just remember, all comments are moderated. That just means that I personally read each and everyone before they are approved for viewing on our family friendly website. Thank you in advance for sharing. Sign Up For Our Free Newsletter: While you’re here, be sure to sign up for our totally FREE NEWSLETTER. I’ll send you an Email every once in awhile to remind you when I post a new recipe, or when anything else of importance is going on around Taste of Southern. It’s totally free, and super easy to sign up. And, should you ever decide that you are no longer interested, it’s even quicker to unsubscribe. How cool is that? I’ll be looking forward to seeing you add your name to our list. The signup box is below and you’ll also find one in the top right hand corner of each page. I hope you’ll do it today. I’m from South Carolina and Mama always made these during the holidays. She would either use spicy pork sausage or add cayenne pepper along with salt and pepper to the mix. This brings back such good memories. As far as the Duke’s (gotta be Duke’s) mayonnaise and Heinz Chili Sauce dip it is called “Comeback Sauce” and there are many recipes on the internet for it (also has other ingredients). It is especially popular in Mississippi. It is also a great dip for fried shrimp and fried oysters. I made Sausage balls Saturday a week ago and they have been in the frig for a week today . Are they still ok to eat and how long can you keep them ? . They have been cooked . Hello Steve! I like to add chopped dates to my sausage balls! It is so good! I use one box of the dates to the recipe! Yum and Yum !! Thanks Steve ! I’ve been making these sausage balls for years! I make them with Cracker Barrel White Vermont Cheddar cheese in the black wrapper (or the green wrapper if I can’t find the black wrapper) and I melt the cheese in a double boiler over water. I mix the Bisquick and sausage together first and then pour the melted cheese over that mixture. Carefully mix with a spoon for the first few minutes then use your “clean” hands to finish mixing. I really like the taste of the white cheddar over yellow cheddar. Thanks so much for this recipe. 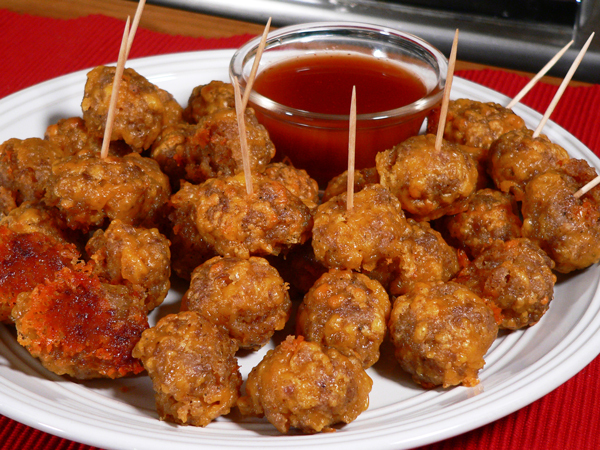 I haven’t seen sausage balls in a long time and definitely need to make some soon. I remember having them at a church event and they were wonderful. My grandparents were cousins on the Stewart side. One great grandfather had married again after his first wife died and eventually the descendants of both wives married each other.It was a family tree that didn’t branch much. I make these using pepper jack cheese and add a touch of garlic powder, delish! Hello Steve, We don’t have Bisquix here in South Africa, wondering if I can use Scone Mix? It contains all purpose flour, sugar, raising agents, whey powder and salt. (By the way, scones here are what you call biscuits, while our biscuits are your cookies!). If not what would I use to put it together? Also we don’t get pre-packed sausage meat. I would usually remove the casings from boerewors which is a spicy beef sausage – many different recipes. Do you think it would be better to use regular sausages? And if so, beef or pork? I love your recipes, they remind me so much of growing up in Norfolk (England)during and after the Second World War, Mum made such tasty dishes despite rationing. Our younger people in the towns have so often lost the art of cooking tasty dishes and their kids grow up on pizza, hamburgers and other takeaways! Sad. Keep up the good work, Steve, it’s much appreciated. God bless you and all your readers. I like these as well and make them several times a year, usually around the holidays. I’ve never served these with a dipping sauce and I’m curious what type you show in the picture above. You didn’t mention it in your recipe. I am definitely going to grate the cheese myself from now on…always wondered why the packaged variety didn’t turn out like I expected…thanks. I’ll let you know how mine turn out. It’s always a toss up for me choosing my very favorite appetizer, it’s between sausage balls and cheese straws… isn’t it strange how cheese and flour seem to be the ingredients that are common to both? By-the-way, your comment about the leaves of fall, from your newsletter… that splendor of color, is one of the visions of nature that few artists can properly duplicate…a true gift of GOD! Steve, what is your favorite sauce to have with these wonderful meatballs? I’m thinking either sweet and sour or bbq, but I thought I’d ask the expert! My family looks forward to the holiday seasons, because I do make this recipe. Mainly on Christmas Eve, as my sons and their spouse come and spend the night with us, no grandchildren yet. They snack on them all afternoon and early on Christmas morning while opening gifts and before having breakfast. They are great to have around. And I have frozen the uncooked sausage balls before too, and that works great to have around when people just drop by. I am looking forward to your other recipes this month. Hmmm, I think I should practice on some today! My husband agrees. Have a great week, love your newsletters and recipes. My grandma used to make these for us and they are so delicious and easy to make. She would serve hers up with some kind of sauce that she used to make with Duke’s mayonnaise and Heinz chili sauce and it was pretty good too, I liked it with her fried green tomatoes. Yummy! Her holiday meals always started with appetizers and soup and salad. She used to make cocktail sausage’s with brown sugar and bacon that were baked in the oven and I also loved her stuffed mushrooms. I have nothing but happy and comforting memories of my childhood spent in her kitchen. 🙂 Your blog takes me back to those days. The world is changing so quickly now I pity the kids of today who don’t have a grandma’s kitchen to grow up in. I think I’ll whip up a batch of these to snack on later this evening. I’m looking forward to your appetizer recipes and cake recipes next month. Have a good week and God bless you. I love these! Great simple appetizer! I can’t wait to see what other recipes you have in mind for the month being that its Football season and all. Take care and thanks for your lovely newsletter. I look forward to your travels, recipe shares & stories.